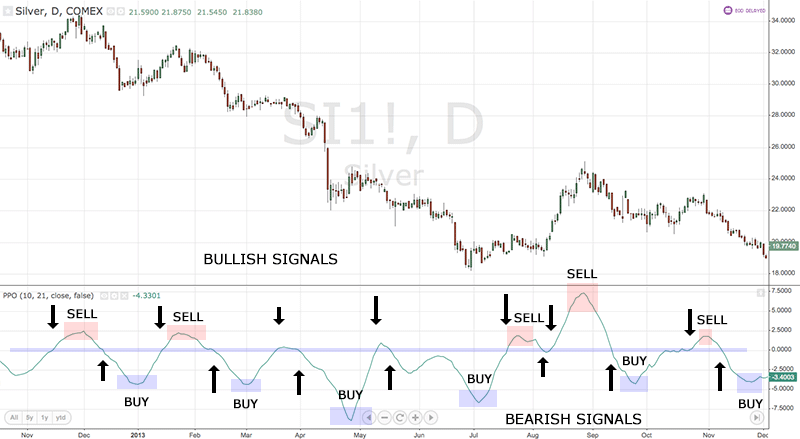 Also called just Price Oscillator, this momentum indicator shows the relative difference between two two moving averages as a percentage of the larger moving average. This allows a trader to more easily compare two currencies with differing prices. If the value of the Percentage Price Oscillator is 15, this means the short term average is 15 percent above the long term average. A Bullish Signal is given when the PPO rises above the zero line. The oversold level is the bottom of the PPO. This is when you should look to go long. A Bearish Signal is given when the PPO falls below the zero line. The overbought level is the top of the peaks of the PPO. This is when you should look for shorts.